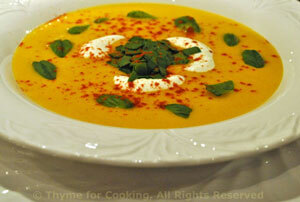 Cook Carrot Soup, a bit of Spice, Thyme for Cooking gourmet soups. The soup is cool but the spices add a bit of warmth. Use hot paprika or a bit of cayenne pepper for more heat. Heat butter in medium saucepan. Add onion, celery and sauté until tender, about 5 minutes. Add carrots, potato and stock. Bring to a boil, cover, reduce heat and simmer until carrots are done, about 15 minutes. Purée solids in blender adding as much (or all) of the stock as you like. If soup is too thick, add more stock. Snip basil leaves if they're large. Ladle the soup into bowls, top with yogurt and basil leaves. Sprinkle with a bit more paprika and serve.